When you think of online video marketing, most of us instantly think of YouTube as the dominant player in the industry. 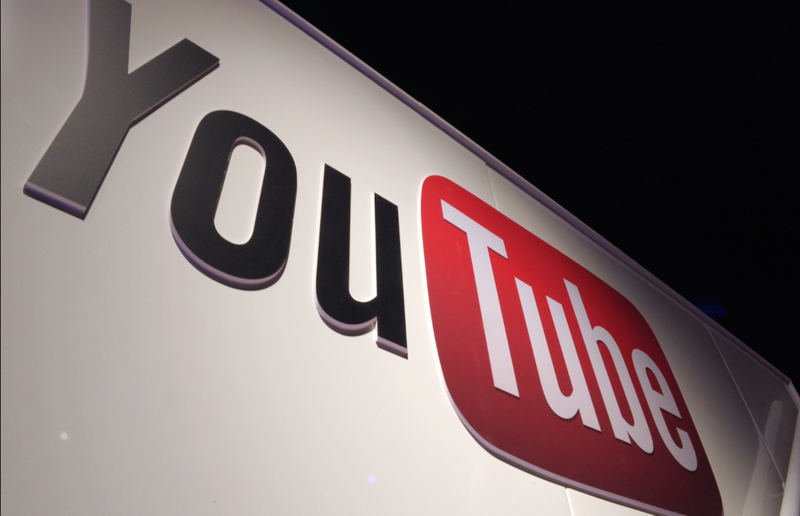 Between its billion users and robust features for marketers, it’s honestly no surprise that YouTube has long been the leading video distribution platform. When you factor in the numerous benefits that video marketing presents advertisers, it’s also no wonder why more and more businesses are getting into the video content game. What’s interesting, however, is how quickly Facebook has become the second largest referral source for online videos. In fact, according to a study conducted by social media software and analytics company Socialbakers, of 180,000 Facebook videos posted across 20,000 pages in 2014, content marketers had increased directly loading videos onto Facebook by 50 percent from January to June. Since the implementation of the auto-play feature in the Facebook News Feed, interaction with video content has changed and everyone knows it. In a way, this shouldn’t be all that shocking. Videos are a great way for marketers to gain more attention and increase conversions since they can inform and entertain visitors. Viewers also love to share videos – 92 percent of mobile video viewers share videos with others! Shareaholic found in October 2014 that Facebook drives four more times the traffic to websites than Pinterest, YouTube, Twitter, Reddit, Tumblr, and Stumbleupon. Facebook has more than 500 million active users, which makes it the second most trafficked website in the world. According to comScore, Facebook is the most popular social site for mobile users with 24 percent of users spending their time there. Facebook is the leading social login with 46 percent, Google was second with 34 percent. The average American spends 40 minutes a day checking their Facebook feed – that’s more time than they spend with their pets! Facebook ads can help increase email offers. Users can tag Facebook friends in videos, which means Facebook has some useful keyword encoding capabilities. Engagement with videos on Facebook has changed since they implemented auto-play features that get user’s attention. For the last year, my team and I have noticed a sharp increase in Facebook videos. 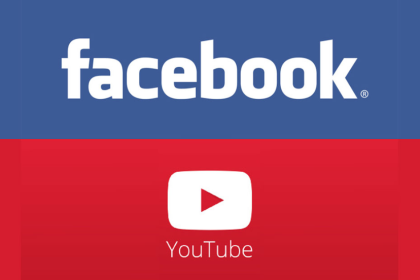 More interestingly, we also heard rumblings from numerous sources that Facebook was favoring native video uploads over third-party video embeds like YouTube. 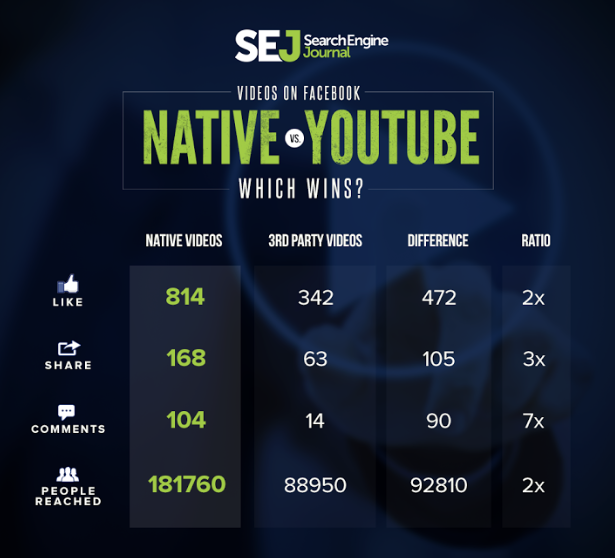 This prompted us to conduct a study that compared the same video content as a YouTube video embed and native video upload on Facebook. The study began by selecting three separate Facebook pages that had a sizable following (1M+ followers combined). We then choose seven videos that we felt would be perfect for each page. This would total 21 videos and 42 Facebook updates combined. We then created a schedule where we uploaded the same videos at the same time, on the same accounts, for both native video uploads and YouTube video embeds for two weeks. Half the updates began with the native video uploads, with the other half starting with YouTube video embeds. We did this just in case if that impacted an individual’s decision to engage or like the video after noticing it for a week. 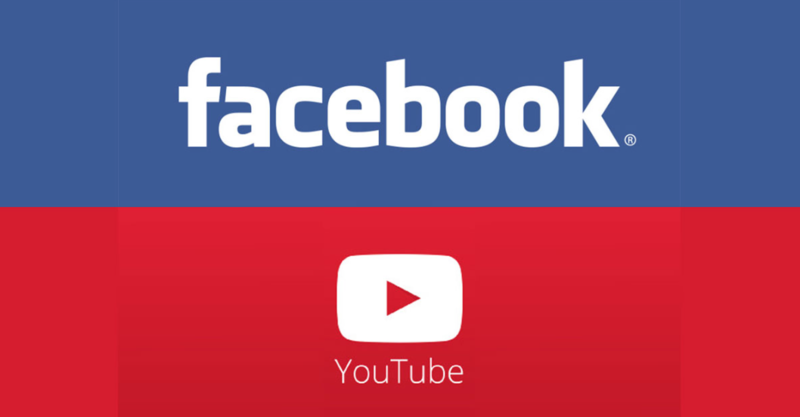 So, apparently, the theory that Facebook is prioritizing native videos over third-party video embeds, seems to be correct — at least when compared to YouTube. According to our study, we discovered that on average, native Facebook videos reach 2.04 times more people, receive 2.38 times more likes, 2.67 times more shares, and 7.43 times more comments. In the Socialbakers study mentioned earlier, they came to a very interesting tidbit that you’ll want to keep in mind as you start shooting video content: keep it short! As in, under 30 seconds – 22 seconds to be exact — is the number you want to shoot for, as the study determined that videos at that length had the best completion rate. In other words, viewers who watched over 95 percent of the video did so more at that length. The challenge here is to learn how to get the point across to your audience in that short period of time. Creating video content can be time consuming, so figuring out the right formulas to creating content that is going to motivate your audience to take action is crucial. A great way to test this is when you’re just starting out to use Facebook’s video advertising feature to get targeted viewers to watch your videos right away. Just like regular ads you’ll be able to target their interests, behaviors, age, gender, and location across every device. So you just shot and edited the greatest video for your business ever created. How are you going to get fans and friends on Facebook to turn the volume up and actually watch it? With all the content being consumed every day, you’ve got to have your copy writing skills down pat. Make sure you do your best to optimize the following information when uploading your Facebook videos. Write a great title – ask yourself “what would make somebody watch this?” Your videos should be helping entertain or solve a problem so learn how to peak their interest. Keywords – pretty self explanatory, but some of us need reminders that Facebook also has a search engine. Are you including keywords properly? Description – don’t be lazy when it comes to your description. Too many people get excited during the uploading process that they forget to add key additional information here to entice views. Informational – always a go-to in content marketing. Create how-to videos that show people how to complete a single task, and create them en masse to both solve problems and show that you are an expert at what you do. Educational – in addition, you can use video to teach others just like you would in a classroom. Whiteboard and green screen videos are simple, but effective ways to grow the minds of your audience. Entertaining – Have fun and create something funny or amazing that will get people to smile and share with others. Just make sure it fits your brand and marketing strategy and you’ll have a win-win video on your hands. For marketers and advertisers, it’s obvious that video has become one of the most interesting, and viable, marketing options for businesses. 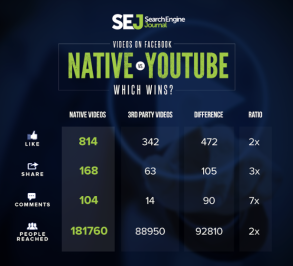 While traditionally we turned to platforms like YouTube, Facebook has now seemingly changed the game by favoring native video uploads over third party embeds. And, because Facebook remains the largest social network in the world with over 1.4 billion users, it only makes sense that you not only upload videos directly onto Facebook. However, to get the most out of it, you must also make sure that the videos appealing to your Facebook audience.